What is the purchase price of the item? Is there a deposit and if so, how much? Is there a trade in and if so, what is the value? What is the amount remaining to pay? Below are two of the most common types of HP transactions that the team on our Helpdesk come across. TIP: Talk with your accountant first about the codes you could use and the GST content for the transaction. 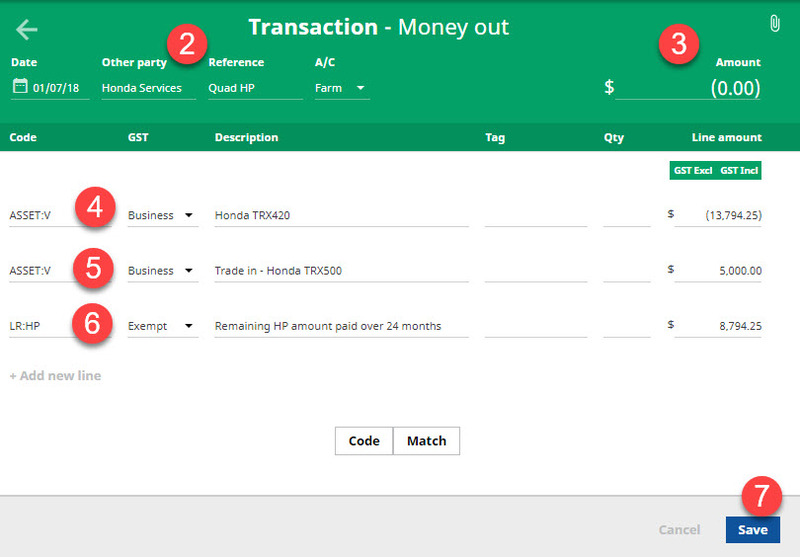 Adam has purchased a new Honda TRX420 for $13,794.25 inc gst and traded a Honda TRX500 for $5,000.00 inc gst. He didn't pay a deposit which means there is $8,794.25 to finance. Create a Money out bank transaction. If you're invoice basis for gst, create a new money out invoice. The date, other party and reference could reflect corresponding information on the HP agreement/invoice. The A/C (bank account) should be the same account that future HP payments will be made from. Leave the amount as (0.00) as no funds have moved through the bank account. Code the new asset on the first line of the transaction as an expense, including the incl gst amount. You could code the line to ASSET:V (Asset Purch or Sold : Vehicle). Then click Add new line. Use the second line to code trade in details (if any) as income. You could code the line to ASSET:V (Asset Purch or Sold : Vehicle). Then click Add new line. The final line should indicate the amount remaining on HP - coded to LP:HP (Loan Repayment : Hire Purchase), and should be displayed as income. Once the transaction has balanced back to $0.00, click Save. Adam purchased a new Honda TRX420 for $13,794.25 inc gst and traded a Honda TRX500 for $5,000.00 inc gst. He paid a deposit of $3,500.00 which means there is $5294.25 to finance. Because there is a corresponding bank transaction for the deposit, you can code the transaction when it comes into Cash Manager Focus. The date, other party, reference, A/C and amount should reflect the information relating to the bank transaction for the deposit. Follow steps 3 - 5 above to enter information into the transaction. 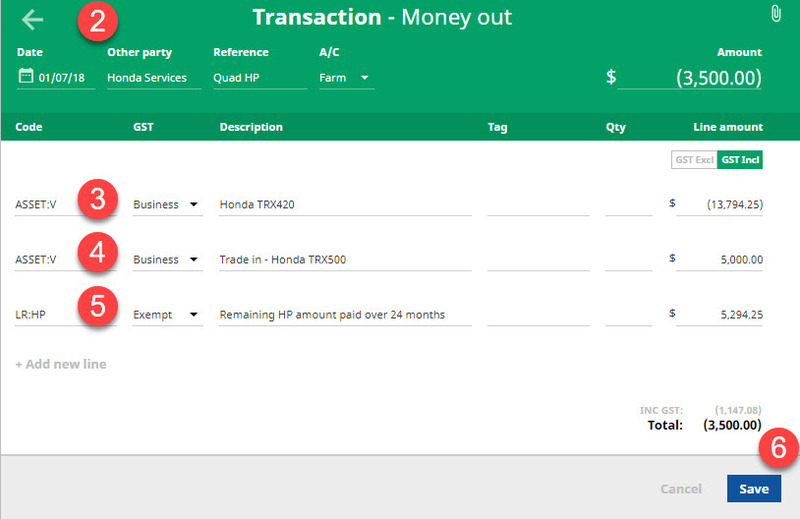 Attach a copy of the HP agreement or invoice to the transaction and include a clear note of the trade-in i.e. the model and serial number. This will make it easier for your accountant to reconcile it in the end of year accounts, add the new asset to the Asset Register and remove the old one. Why is the remaining HP amount displayed as income? Think of the HP as a loan. The remaining amount needs to be displayed as income because it is similar to introduced funds or a draw down of a loan. It appears as income to be used against the purchase. As the monthly payments are made, the amount owing on the item will decrease, similar to a loan repayment. Each payment should be coded back to LR:HP (Loan Repayment : Hire Purchase) and be exempt from GST. Remember, the GST claim has already been completed so you don't want to accidentally claim it again. Because the payment will be recorded in the bank account, treat this as a normal single lined transaction.